Here is Splash, our favorite adopted ex-stray cat, wearing his hoodie a few weeks ago. 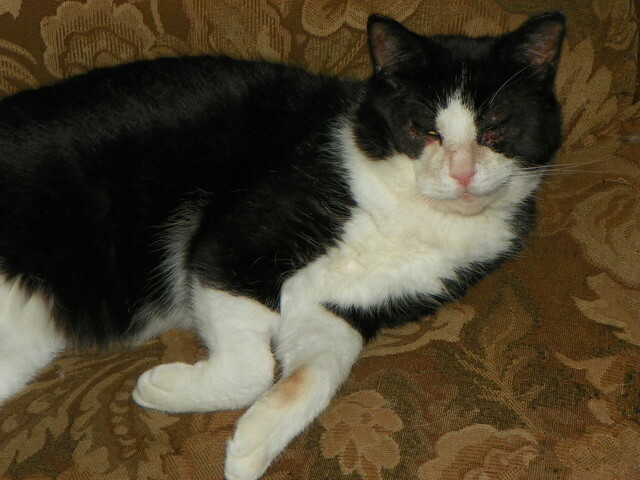 While he was living rough, Splash suffered from chronic eye infections that had left his eyelids swollen. As a result, his lashes curled under and scratched his eyes, causing a constant weeping discharge. The vet said that the only cure was an operation to lift the lashes away from his eyes. 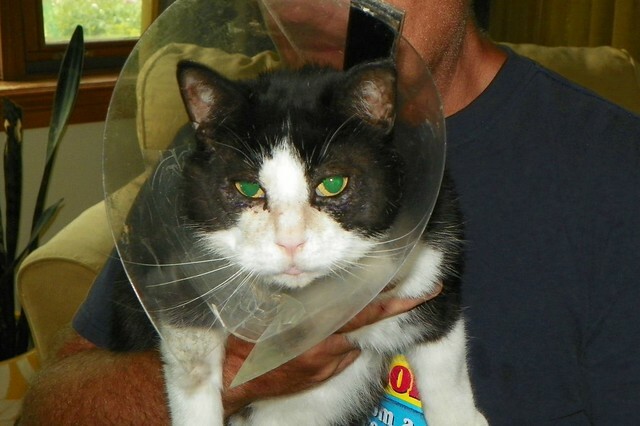 Splash underwent the surgery at the end of May and had to wear a collar to protect his eyes from his scratching until the stitches had a chance to heal. He was not happy about this. 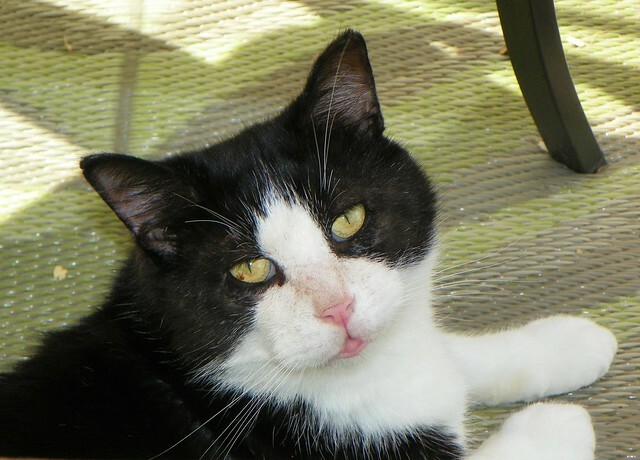 Here he is after the stitches were removed, 11 days after the surgery. It took another little while for the incisions to totally disappear, but it was obvious that the surgery had been a success. His eyes looked clear and bright. Once the collar was removed, Splash set to work diligently cleaning himself, now that he could once again reach his tongue. Now he looks like a new cat. No more weeping eyes! And he is as much of a sweetheart as ever. With the advent of the fireplace season, it can be hard to find a cat-free seat in the living room. There’s nothing the cats love better than a comfy seat on a cold day. 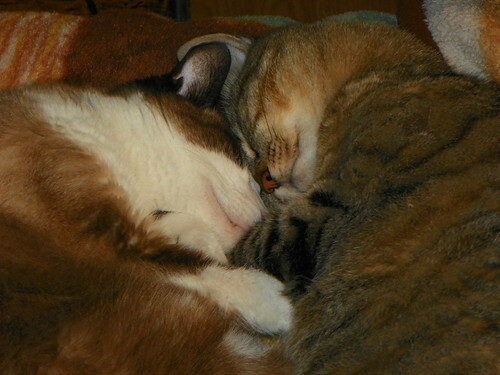 Here are Tonka and Capone, snuggled up together. That’s Tonka on the left. He’s a senior cat, 16 years old. 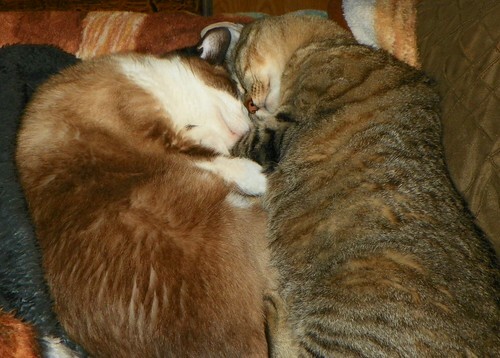 He settles himself first, and then his good friend, 9-year-old Capone, gently insinuates himself into Tonka’s space. Happy together. Our local grocery store makes boxes available to customers to carry home their purchases. I always keep an eye out for cat-size containers because nothing pleases a feline like a box. This recent acquisition, which formerly held peppers, was a hit. 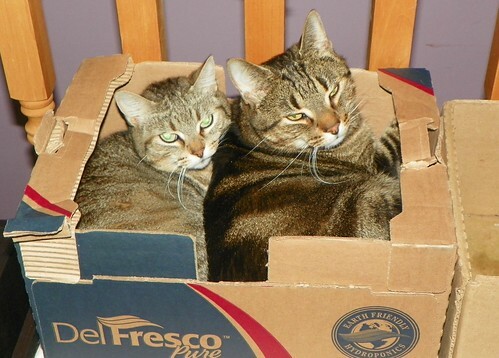 That’s Capone (left) and his younger brother Arthur, sharing their new favorite box. 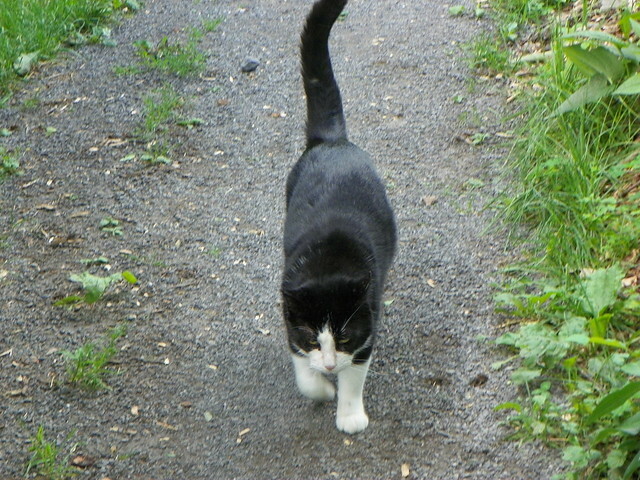 Here’s Splash, the latest addition to our feline population. We first spotted him last winter. He seemed to be living in the hay barn. I put food out for him when I saw him, but he was fiercely wild. 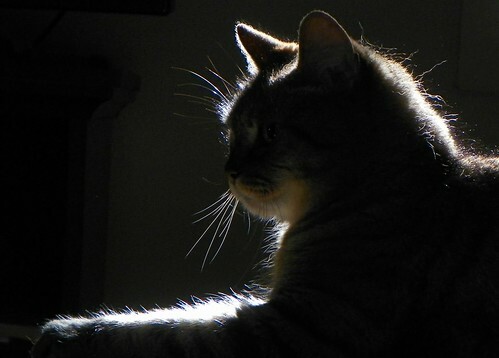 If he noticed me looking out the window at him, he’d be gone in a flash of black and white. 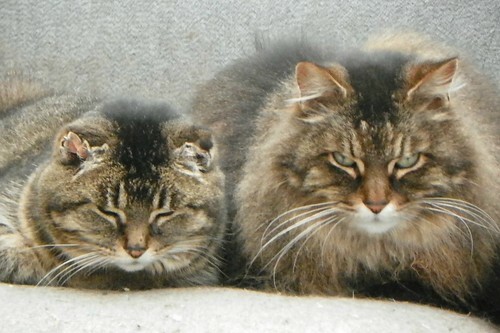 Stray cats are a common phenomenon in the country, and some remain feral. But by spring, the concept of easy meals began to win Splash over. He approached closer and closer to the house, and then the porch, until one fine day he let us pet him as he accepted out handout. 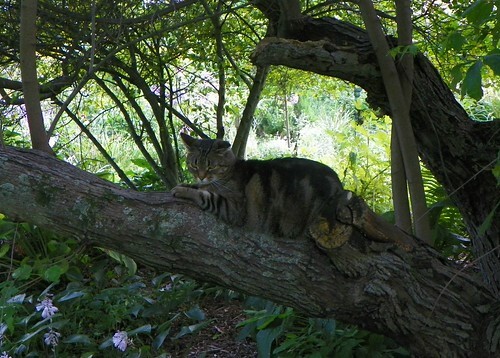 As the summer matured, I began to think it was time to see about a trip to the vet for neutering. Last weekend, when Splash showed up one morning with a limp, I knew it was time to get him checked out. 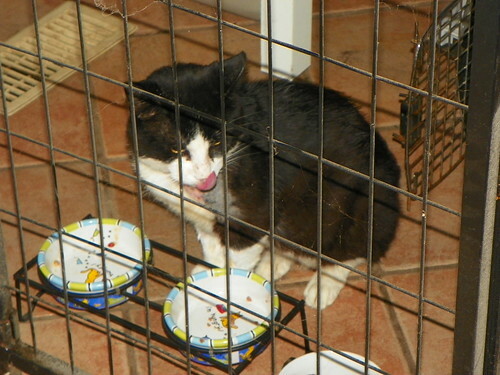 RailGuy was able to round him up into a cat carrier, and off Splash went for his first vet visit. We were worried about how he would handle this sudden assault by we humans. Would he attack the vet? But all was well. Splash was surprisingly well-behaved. It turned out something had bitten him on his shoulder and the wound had abscessed. While Splash was sedated so that the wound could be cleaned up, the vet also operated on his other end, and he also had his vaccinations. Now he’s back home, with instructions that he be constrained in a quiet place for a few days. He’s doing fine, but doesn’t understand why he is under house arrest. Pookie is keeping him company. 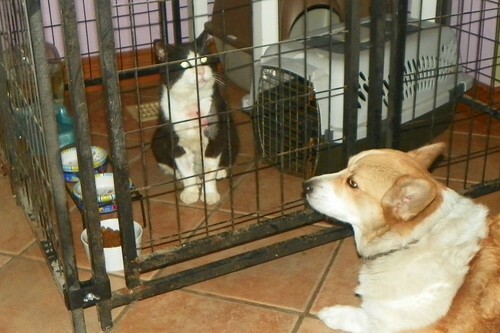 Pookie mostly ignores all the cats, but the food dish in Splash’s space is magnetically attractive to the ever-hungry corgi. So tantalizingly close, and yet so out of reach!